How To Easily Create A Forum On A WordPress Site? Forums are a great way to manage and increase user interactions on your website. They can be used to build online communities. Creating a forum on your website can be a daunting task, but the availability of the many free and open-source forum software make it really easy. The real issue might arise when integrating one of these with WordPress, without having to create forums on a separate sub-domain (and hence as a separate site). Fortunately, you have a solution for that as well in bbPress - the most popular forum software for WordPress. 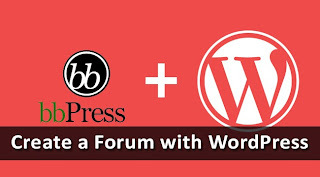 Creating a forum with WordPress is amazingly simple. And if you had ever been intimidated by the idea of creating your own forum, you'll be surprised at its simplicity. At its core, it simply involves installing a WordPress plugin, and then setting up some forums and rules. The rest will come naturally with time. bbPress is a free forum software built into WordPress as a third-party plugin. It does not require you to log into your cPanel for installation and management (as with other free software such as phpBB). Rather, it can be installed and managed from within your WordPress dashboard. Additionally, you can install more plugins to enhance its features, making it the go-to choice for beginners and even experienced WordPress users. To install bbPress, go to your WordPress dashboard, and click on Plugins >> Add New. Search for bbPress, and install the plugin from the search results. Or you can download the plugin as a zip package, and upload it to your WordPress dashboard. After installing the plugin, the next thing you should do is create a new Forum. You can see that after installing this plugin, a new tab in your dashboard has appeared labelled Forums. You can create a new forum by going to Forums >> New Forum. Creating a new forum is just like creating a new post or page in WordPress. You can specify a title, permalink, parent forum (if any), and so on. Create all the forums you need this way, and specify a hierarchy. One done creating all the forums, it's time to display them on a page. Create a new simply page from the WordPress dashboard, and give it the name "Forums" or similar. Then, enter the following shortcode to make all the forums display on that page. Here's what a forum index looks like. Note: If you have the plugin Genesis Shortcodes, you might encounter some problems displaying your forum index. Try disabling the Genesis plugin. There are a couple more things you need to do before you're fully able to use your forums. First, you'll have to create a page for new user registration, and then create a page for 'lost password' cases. To create a register page, create a new WordPress page, and in the editor, write the following shortcode. Similarly, to handle lost password cases, create a new WordPress page again (with an appropriate name and permalink), and then add the following shortcode. Now, one final thing. You have to open your site for registration. After all, users will need to register, right? To do this, go to your WordPress dashboard, and then go to Settings >> General. Now find and check the field that says "Anyone can register", and set the "New User Default Role" to "Subscriber". bbPress comes with a set of widgets. A great one is the login widget for your sidebar. To add this, go to Appearance >> Widgets, and drag the [bbPress] Login Widget to your sidebar. Now, add in the title, Register Page URL, and the Lost Pass Page URL. New users will see a register button, whereas logged in users will see a logout button. That's all there is to adding forums to a WordPress site. It's simple, and effective, and doesn't require you to maintain a large set of databases. If you just want to add the functionality of forums without having to develop a whole management system, then this is the solution for you. I have a doubt. Where should i paste these codes like [bbp-register]. In the post body?? Hello sir, how can one add forum in blogger blog platform. There are many essential web site design tools available for those who want to get help in designing their web site and other graphics like logo etc You can refer XnYnZ.com they do web design service as well to get connected with the tools as well.I designed my website using this site ,i feel its The Best .They provide the domain name and hosting ,at low cost which helps to create a professional website very quickly. hope it helps you..
Great Work and really nice way to create the forum, not just simple but very quickly !, Keep posting useful posts like this. I think bb press forum is the best software and we manage very simply on our WordPress dashboard and make best forum.Thanks for giving us such useful tips.